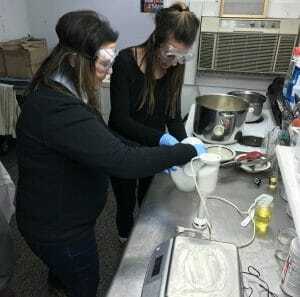 Soap Making Class. The Best Birthday Present Ever! I had a soap making class in my studio on Long Island a few days ago. I usually only take 4 students at a time. My studio is small and I want to be able to give everyone personal attention. But I decided to open the class to 6 this time. I had 4 students signed up until the day of the class, and 8 hours before the class was to start, Brittany bought the last two spots. One ticket for her, and one for her mom Christine as a birthday gift. I emailed Brittany and told her to wear comfortable clothes she didn’t mind getting dirty. I have aprons for all my students, but sometimes the oil splash and I don’t want my students wearing something they are concerned about ruining. When Brittany and Christine arrived at my house, they were both laughing. Turns out Christine wasn’t told where she was going, just that she needed to wear comfortable clothes. She told me she was nervous and thought she was going rock climbing or wrestling. In fact, Christine was so worried that Brittany told her in the car on the drive over. Brittany told me her mom had always wanted to learn how to make soap, and Christine told me Brittany was her only child who listened to her! 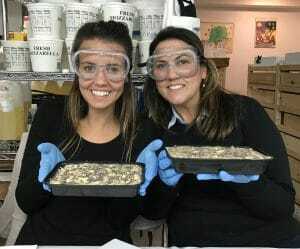 🙂 Both mother and daughter were really excited to make soap. The rest of the class consisted of 3 friends (Samantha, Jeannette and Sara) who signed up together and my soap customer Jennifer. I enjoy all my classes and this one was no exception. Everyone immediately bonded and by the end of the night I was so glad I opened it to 6 students. It was a little tight, but workable. There was more positive energy in my studio, and much laughter. I love the smiles on their faces! 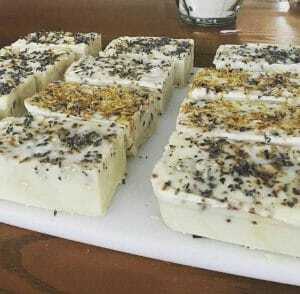 Christine put some pictures of her soap on Instagram. I think she’s a natural! I’m grateful I was able to make Christine’s gift the best birthday present ever! Beautiful photography and the soap looks amazing. I wish I could take credit for the pictures Sharon, but one of the other students took them, I’m not sure who. Looks like a lovely day! So glad you enjoyed! Looks like a lot of fun. The soap is so pretty. Thanks Donna, I’ll pass your comment on to the students.